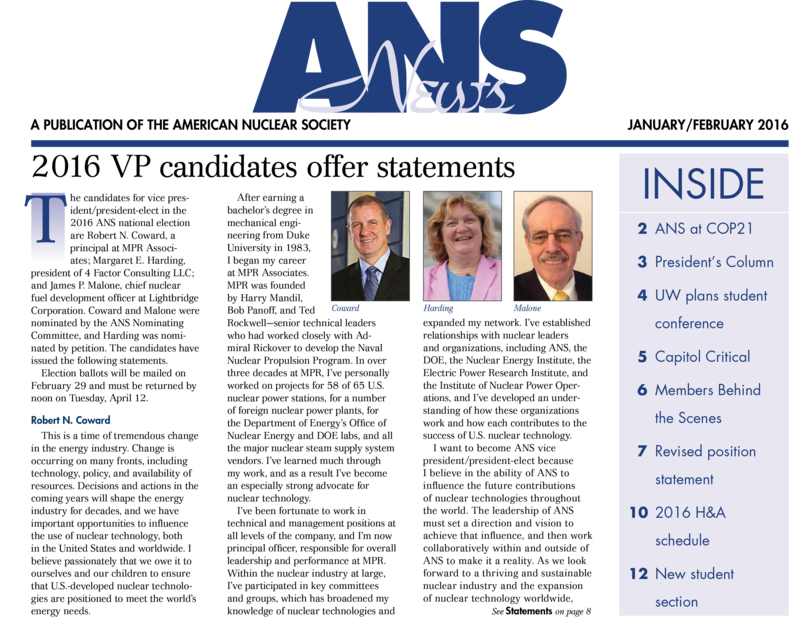 ANS News is the American Nuclear Society's digital newsletter covering the people, activities, and events of the Society and is distributed electronically to all ANS members. Included in the bimonthly issues are regular columns by the ANS president and the Society's Washington, D.C., representative; articles on the activities of ANS committees, professional divisions, local sections, and student sections; and news of developments within headquarters departments, of prominent ANS members, and of international and outreach activities. Your sponsorship of each bimonthly issue includes: a banner embedded within the member notification e-mail, a leaderboard banner permanently displayed on the ANS News archive page (until the next issue is published), and either a full page or a ½ page 4–color advertisement within the issue. Banner ad: File Size: 468 x 60 pixels at 72 dpi (max 40 kb). Acceptable File Formats: JPG or PNG (no animation). Leaderboard ad file: 728 x 90 pixels at 72 dpi (max 80 kb). Acceptable File Formats: GIF, JPG, PNG, BMP, TIFF, PSD. All files must be RGB colors; non-Flash images; no tags allowed.